Exploring the past of a man without a past is wonderful sport for documentarians. They invent as much as they discover. Some viewers may be frustrated with the lack of concrete achievements, the CV. Or one may be enchanted, and then feel the experience slip away. Niewiera and Rosolowski's documentary is an exploration and a visual poem. It's enchanting and dreamy, despite continually returning to earth. Their film is notable for its free, artistic use of archival footage, almost creating a feature film out of their inspired patchworks. They have also done some tremendous sleuthing work at far-flung locations from Ukraine to Rome to Tel Aviv. Perusing online biographies of Michał Waszyński, or Michael, or Mischa or Moshe Waks (his given name), or, better, a blog in Polish summarizing a 2008 biography by Samuel Blumenfield, one realizes this film has been rather vague about some of the basic facts about this rather strange man. To make them clear will falsify the film, but we may have to. The fact is that he does have a CV, a very detailed one. It's just his inner life that is a mystery. And he did hide his original identity. But perhaps his inner life isn't such a mystery either, given his extensive diaries, quoted from throughout this film. It's just that he was a mystery to the people who knew him. Begin with the diaries of Michał Waszyński, apparently in Yiddish, though this is not remarked upon. It is best to leave his past behind, he says. But if he kept a diary in Yiddish, since he fled early from his native Kowel, "on the far borders of the Polish-Lithuanian Commonwealth" (Polish blog), where he was born on September 29, 1904, he always carried his past with him, haunting him, even as he hid it, like a dybbuk, possessing him. Moshe Waks was the son of a blacksmith and poultry trader and a "brilliant student of the yeshiva, when he was expelled from the Talmudic studies center for a heresy. Shortly thereafter, in 1919, he left his family home and left Kowel forever[;] he was only 16 at the time." There are six years that are a blank, but at 22 Waszyński, as he now called himself, popped up in Warsaw making movies, and the filmmakers have found some publicity, from 1937: "Previously known for his melodrammatic films and quickly thrown-together comedies, he is shooting a new film...something special, a mystical, Jewish drama, The Dybbuk" (from the play by Szymon An-ski). Goebbels saw this film and had it quashed, declaring (switch to German) "The Jewish race is the most dangerous on the globe." The film (Waszyński's most famous?) features dreamy-handsome young men in payot. The makers of this documentary believe, or hint, that their subject was possessed by the "dybbuk," the spirit of a lost love, probably a boy he longed for at the yeshiva, mentioned in his diaries, who did not return his feelings. 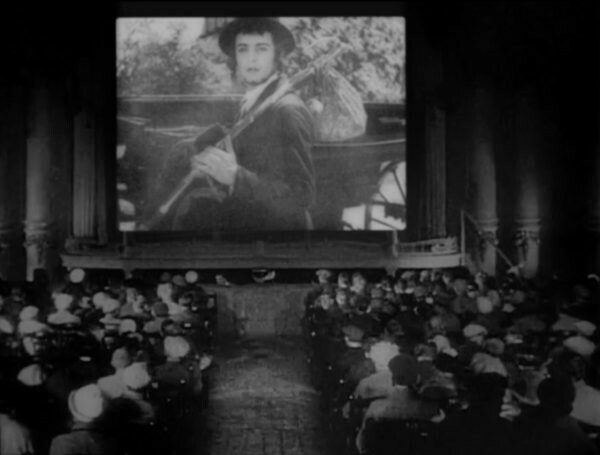 Amazingly enough, the filmmakers seem to have found a film of people watching the film. The excerpts of it that we see suggest a masterpiece, containing imagery doubtless much influenced by the silent German expressionist masterpieces. Comes the war, and the Waks family of Kowel escaped or was killed. The Jews of Kowel took refuge or were herded into the largest synagogue. It still stands, a handsome building, and is a clothing factory. Brilliantly, the filmmakers muse over rows of dark suit jackets in the factory as we hear witnesses of the sacrifice of lives here. But Waszyński was long gone. In the war, he turns up in the Russian-Polish army of General Anders, as a filmmaker. And we meet two sprightly old veterans of the same army who knew him, reading military reports on his intelligence, creativity, but lack of leadership. These two old gents are one of the best moments of the film. They are thoroughly forgiving of their comrade's later affectations, especially of his shacking up with a rich old countess and inheriting all her money. Good for him, they say! They don't mention that he was a Jew and a homosexual. It does not concern them. Or he hid it successfully. Anders' Army was a way that many Jews got to Palestine, but the film doesn't mention this. We've been hearing about how splendidly "The Polish count," "il conte polaco," lived in Rome. Dark films of a Rolls tooling through Rome and words from Waszyński's former chauffeur hint at it, and Italian friends who speak of how elegant he always was, surely could have been a prince. At a later more climactic moment the chauffeur, now perhaps a little too portly to get behind the wheel even of a Rolls, describes drives around from cinema to cinema or cafe to cafe of Rome with his boss chanting "cerchiamo il dybbuk, cerchiamo il dybbuk" (we're searching for the dybbuk, searching for the dybbuk). It is almost too made, too good to be true. But go back to just after the war, and we see excerpts from our subject's impossibly beautiful 1944 black and white documentary short Capture of Monte Cassino, its sad, haunting images. And then later, the 1948 Unknown Men of San Marino - a sequence of a (shell-shocked?) man who can't remember who he is, and takes on an aristocratic identity. At the end, while Waszyński was living an impossibly glamorous life, consorting with Sophia Loren, Orson Welles, and many others, he participated in the making of even grander films like The Barefoot Contessa (with Ava Gardner and Humphrey Bogart), and Cleopatra. Waszyński was working with Joseph L. Mankiewicz. His daughter questions his rather deaf widow. No, "Mike" (as he was now) didn't marry, the widow says. He had a boyfriend. But no, he didn't "sashay around." We slide to Spain, with James Mason narrating a "making of" about the ambitious sets for The Fall of the Roman Empire. The most extraordinary and expensive yet. This was, we realize, the Sixties, the time of the most grandiose movie productions in many decades. And "Mike" was there, in charge of them. All he asked was no one should tell when he peeked in the young men's dressing rooms. Another coup of the filmmakers: showing where the sets for the Roman Forum used to be: all "bosque" now, wooded, bushes, grass - the witnesses are speaking Spanish now. There's no explanation, but "Mike" has moved to Spain, where a lot of these super-duper productions were made, and where he died, of a heart attack, as if reaching over to gather a dropped napkin, at one of his "famous dinner parties." A nice way to go. But there's a footnote: a bony old man, of uncertain age, Albin Ossowski, speaking Polish, no doubt a relic of Waszyński's Warsaw film director days. After all, didn't he make at least forty of those "melodramatic films and quickly thrown-together comedies" before that quickly-skipped-over phase of his life was over? Ossowski was handsome, then, he says, and Waszyński liked to go around with him, and put his hand on his knee from time to time. But he never found the dybbuk. The Prince and the Dybbuk/Ksiaze i dybuk, 82 mins., debuted at Venice Sept. 2017 in the Classics section, winning a documentary prize; also at the NYJFF Jan. 2018; at Waltham, Vienna, Amsterdam and other fests icluding the SFJFF, as part of which it was screened for this review. Produced by Poland’s Film Art Production, Germany’s Kundschafter Filmproduktion and Zero One Film. Coming in the Viennale later this year. At the SFJFF showtimes are: on Sun., 22 July at 2:05 p.m. at the Castro, San Francisco, and on Sat. 4 Aug. at 2:00 p.m. at the Piedmont Theater in Oakland.